Victoria Lees is a visual artist who has a wide art practice extending across multiple mediums to create a variety of drawings, paintings, video, installations, decorative and sculptural objects. A little ray of light in the darkness of the night. I wish upon this star, a little hope or joy. To bring to the sad, bored, dreary and unsuspecting a small morsel of magic and delight. Victoria creates Temporary String Sculptures in various landscapes and locations (from parties, festivals to public spaces). The materials are reused and all care to minimize visual and physical impact on the environment is taken. Victoria has a holistic philosophy incorporating theory, experience and practice behind her installations of these Temporary String Sculptures. 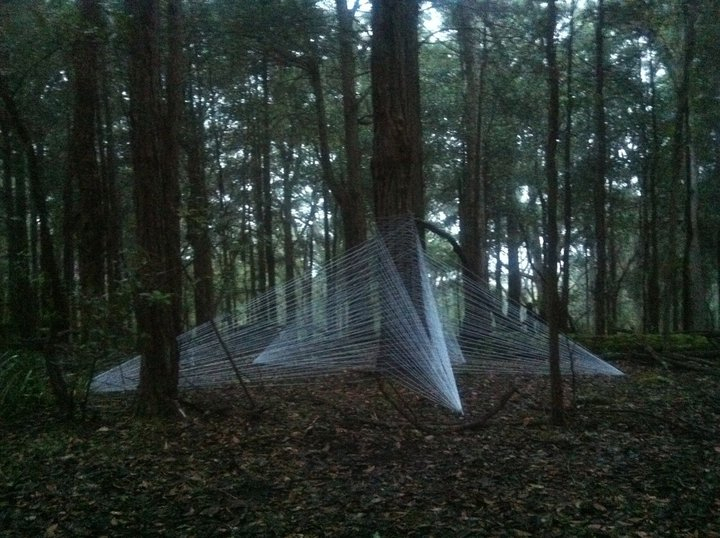 She started creating these Temporary String Sculptures in 2009 after completion of her Master of Philosophy (ANU). These sculptures are her way to create flexible/adaptable, unobtrusive large, portable, temporary installations that sit within and explore the synergies of the environment, utilizing the natural structures and spaces of the trees in the natural landscapes. Each sculpture is a journey, exploring the whole process from conceptual thought, process of creation, the completed installation/s, rewinding process of removal and the minimal residual impact left behind that trace her presence and activity in the environment.